Clarence Cassler did a good deed for me by photographing several HUBBY graves in the Hull Cemetery in Luther, Boone Co., Iowa. These included the shared headstone for my husband's 3rd-great-grandparents, John HUBBY, Sr. and wife, Hannah JONES. A unique feature is that on their headstone it reads "born in New York" for Hannah, and "born in Canada" for John. Would that all our ancestors be so considerate as to list their birthplaces on their tombstones! 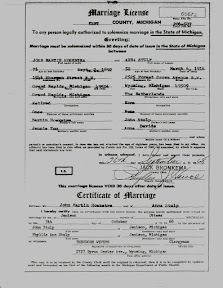 My cousin and fellow Hoekstra researcher, Kathy Birnell, sent me a photocopy of the marriage license/certificate of my great-grandfather/her grandfather, John Martin HOEKSTRA and his second wife, Anna STULP. Anna's brother and sister-in-law witnessed the marriage. She worked as a housekeeper for years for my great-grandparents, and shortly before my great-grandmother, Lillian Fern STRONG, an invalid, passed away, she (Lillian) encouraged John to marry Anna. He did...21 months after her death. I mentioned that I received my first issue of Internet Genealogy yesterday. There was an article about the My Heritage site written by Lisa A. Alzo, so I decided to take a look...and was I impressed! The first part is just a fun area: the Face Recognition program. I uploaded up a photo of myself, and received a list of celebrities that are my look-alikes, among which was Annette Bening, Joan Collins, and Jesse McCartney (the last brought forth a few hysterical giggles from my teenagers). The second part of the site has a free downloadable family tree software program, plus a beta program for creating your own family tree pages online. I was most impressed with the "Research" portion of the site (accessed through the orange menu bars at the top of the page). It claims to have the "most powerful genealogy search engine on the planet," and I was not disappointed! I ran some of my more unusual surnames through the search engine, and checked off some of the alternate spellings using the Megadex feature. I got some terrific hits, and discovered many genealogy websites I never knew existed! The one that I think will prove most helpful is Odessa: A German - Russian Genealogical Library. I don't even have German - Russian ancestry, but my sister's children do, on their father's side. I e-mailed a link to the Odessa page to my sister, and I hope that she will be able to break through a lot of brick walls with this resource! This site is really good. I'm not too interested in the face thing, but the database search is a great tool for finding sources you didn't even know existed. The number of hits this search engine locates is almost overwhelming. It certainly made its way onto my "A" list. I received my first issue (January/February 2007) of Internet Genealogy today, which includes a nice article by friend and fellow EWGS member, Donna Potter Phillips about doing a family research project utilizing mainly online sources. Internet Genealogy is published by the same company that publishes Family Chronicle and History Magazine. I spent some time on the phone with my sister this evening, discussing some of the articles and links found in the current issue. I had purchased a year's subscription for both her and my sister-in-law. Genealogy magazine subscriptions make great birthday and Christmas gifts for family and friends! I have heard that there is free access to subscription genealogy websites during Thanksgiving weekend. Ancestry offers free access to its Immigration Collection until November 30th. They've recently added 80.5 million names to the collection, mostly in passenger lists. If you find your ancestor on a passenger list, you may also be lucky enough to find an image of the ship posted. I blogged recently about finding my TON and Van KLINKEN ancestors at Ancestry. They came over on the E.C. Scranton, an image of which is not available. However, there is a drawing of a similar ship available here, along with the history of the Scranton. Another site that is offering free access is the National Genealogy Society, which has opened up its "Members Only Section" to the public, using the user name member and the password ngspromo. Warning: the site was hit so many times, it was rendered virtually unusable. I sent out an e-mail to the webmaster, and received three very nice e-mails in response, encouraging me to keep trying. I was able to get in for a short period (15 minutes), but the results I got on the searches I made were rather disappointing. I got a nice surprise in the mail yesterday. Richard Valk, a first cousin of my mother, unexpectedly sent me a handful of photos of my VALK relatives. 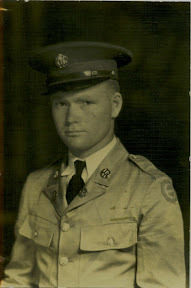 One was a nice shot of my maternal grandfather, William "Bill" Valk, in his Army uniform (WWII). 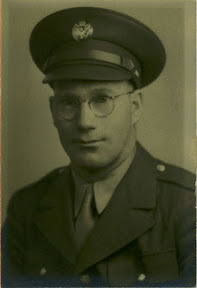 Another was of his oldest brother, James "Jim" William Valk, also in his Army uniform (pre-WWII). 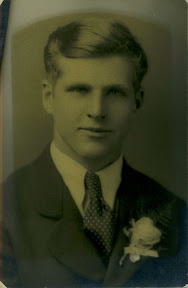 The third was of their youngest brother, Theodore "Ted" William Valk, which appears to be perhaps his wedding portrait: he's dressed very nicely with a boutonnière tucked into his lapel. There were also a couple of snapshots taken c. early 1980's of Ted and his wife, Jim and his wife Thelma, and one of their step-brother Clarence and his wife. 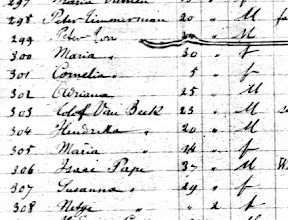 Found my 3rd-great-grandparents, Pieter TON and Maria Van KLINKEN, on Ancestry.com's passenger list (on the ship "E. C. Scranton," which arrived in New York on 7 Dec 1857). Pieter's name was right under Peter TIMMERMAN. The whole list was mis-transcribed. My Pieter is listed as "Peter Con Zimmerman" and so therefore, Maria, his wife is listed as "Maria Zimmerman." Zimmerman, by the way is German for "carpenter," and Timmerman is Dutch for "carpenter." There is also Pieter's sister Suzanna "Susanna" Van KLINKEN, her husband Izak "Isaac" PAPE and their daughter, Netye PAPE. ("Netye" is probably supposed to be Neeltje, who would have been named after Pieter, Suzanna, and Adriana's mother.) They are all with a group from the Netherlands headed for Ohio. 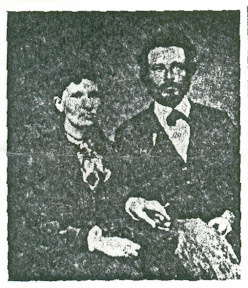 My family records show Pieter and Maria lived in Cincinnati for 16 years, then moved north to Grand Rapids, Michigan. I'm not sure what it was about Cincinnati that attracted them...jobs, a Seceder's Church...? My Jackson Line - Connection to the Mayflower and Ol' Stonewall? Speaking of my Pennsylvania ancestors, Charles' wife, Viola Gertrude Peck was the daughter of Lura Ann Jackson. I've discovered Lura's father was Joshua Jackson of Potter Co., Pennsylvania, and her mother was probably Elsie Rounds (Joshua's second wife). This week another descendant of Joshua, Linda Smith, contacted me. She believes her ancestor, Lucinda Jackson, a (half) sister of Lura, was the daughter of Joshua's first wife, Miriam Standish...yes, THOSE Standishes, of Mayflower fame! Linda quoted a biography of one of Lucinda's grandchildren that states the Standish connection, as well as making the claim that Joshua was related to Stonewall Jackson. I heard today from August Marchetti, one of the founders of the Kanes Rifles, Company H re-enactors. He was interested in posting the biography of my 3rd-great-grandfather, Charles H. Robbins, on his website, Kane's Rifles: 13th Pennsylvania Reserves, Company H ("Bucktails"). Along with the history of the company, there are biographies and photos of the original soldiers, as well as photos of modern re-enactors. Fascinating! You can see the biography of Charles on my website here, as well as his memorial page on Find A Grave. I'm not certain who posted the last comment in regards to the Robbins Biography, but my guess is Miriam Robbins Midkiff. Anyway I just wanted to point out that Robbins Biography, along with several other biographies of Robbins' comrades in the Pennsylvania Reserves, can be found at www.pareserves.com - the website mentioned above was deactivated because our company chooses to do most of its discussion thru email. I'd like to say that this website (www.pareserves.com) contains information on the Original Pennsylvania Reserves, history broken down by regiment and company if possible, numerous biographies, photographs, along with much information on the reenactors who portray the Pennsylvania Reserves as well. I think I finished Bev's website. Beverly Smith Vorpahl, whose name is familiar to the genealogy world as a contributor to Family Chronicle and other genealogy magazines, is a member, along with myself, of the Eastern Washington Genealogical Society. Over the course of the past year, we have struck up a business partnership (with her hiring me as the webmaster of her new genealogy website), and--most importantly--we've developed a friendship. When I say I think I've finished her website, it means that as a webmaster, I always find ways to improve, correct, and add information. Sometimes I drive myself crazy that way. As someone offering a service to a client, I also have to take into account their wishes and needs. I think Bev deserves a medal for patience for putting up with me all these months. We first started talking about this website in February 2006. I began work in the spring, I believe, a difficult time for me to begin any intense project, as I work for my local school district. I tried to do a lot of work over the summer...but must admit, I have an unrealistic view of how much I can do during my summer vacation. I have a lot of projects I attempt to work on during June - August! Once the 2006 - 2007 school year began, it again became a challenge to squeeze in time to work on the site. So here it is. I hope you take a look around and read the fascinating stories Bev has written about her childhood, her siblings, parents and ancestors. She truly has a gift for making the people of the past come to life. Make sure to sign her guestbook, too (a link is provided on every page of her site). Thank you, Miriam. Worth-while things are worth the wait, and our new Website was certainly worth the wait. It's beautiful and professionally done. I could not have asked for anything better. Need a recommendation? Give 'em my number.